Announcing Fabadosi Gourmet Shaved Ice. They are bliss incarnate. Only the finest organic and all-natural flavors are selected and combined in unique and refreshing styles from around the world. 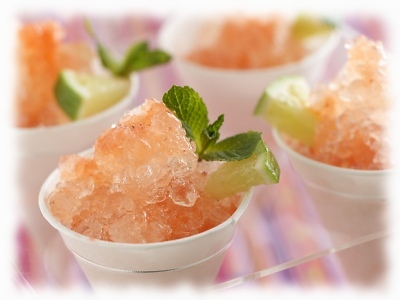 These are poured in layers over freshly shaved ice which has the consistency of freshly fallen snow. All this and good for you too! No artificial flavors, colors or preservatives, wheat & gluten free, non-dairy and Kosher. Our flavors are sweetened with organic raw sugar or brown rice sugar. Both subtle and complex, our flavors delight the young as well as the most discriminating palette. Shaved ice flavors for Phoenix, summer 2009. Other flavors are always in development. For fans of Asian style shave ice, we can do a simple, ice kacang or halo-halo with red azuki bean paste, sweet milk, sugar, organic tamarind flavor and local fruits in season. This exotic specialty is only available for private, catered events. We'll be offering free samples! To launch this new line of products we'll be giving away free samples at certain locations. Add twitter.com/Fabadosi to your Twitter to find out where and when! Shaved ice with different flavors and toppings is the world's oldest frozen confection. Served all over the world today, particularly in Asia, this ancient treat has been available in Phoenix forever. Street vendors called "raspados" (raspers or shavers) sell ice with many different types of flavors. Unfortunately, today most of these flavors are made of chemicals, colors and preservatives. Our recipies are body-positive and packed with their natural nutrients and anti-oxidents. Contact us and start your great event today! In the mean time, click here to see some pictures of us. Click Here to go back to AZHotdog home page. © 2007-2019 AZHotdog Of Arizona, All Rights Reserved. Contact AZHotdog, Phoenix Arizona's hot dog vendor of distinction.